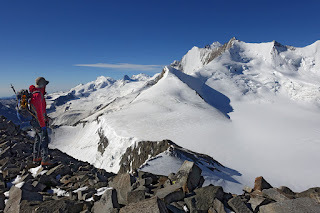 The plan, which we're not sure we're going to be able to do, is to climb the Gross Bigerhorn, follow the ridge along to both Balfrin peaks, continue along the ridge to Riedpass, head up the Ulrichshorn, descend through the Windjoch to the Mischabelhütte and then descend to Hanneg and the gondola down to Saas Fe. The questions are whether or not we're fit enough to get up to the Ulrichshorn and whether or not we can do the whole thing fast enough to get the last gondola down from Hanneg. 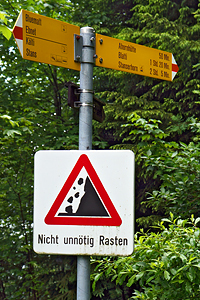 We can always go with plan B: a glacier descent to the Bordierhütte and then the long hike back to Gasenried. After breakfast at 4, we are underway with headlamps at 4:40. The path, with reflectors up until the fork up to p3146, is easy to follow, particularly after yesterday's reconnaissance. 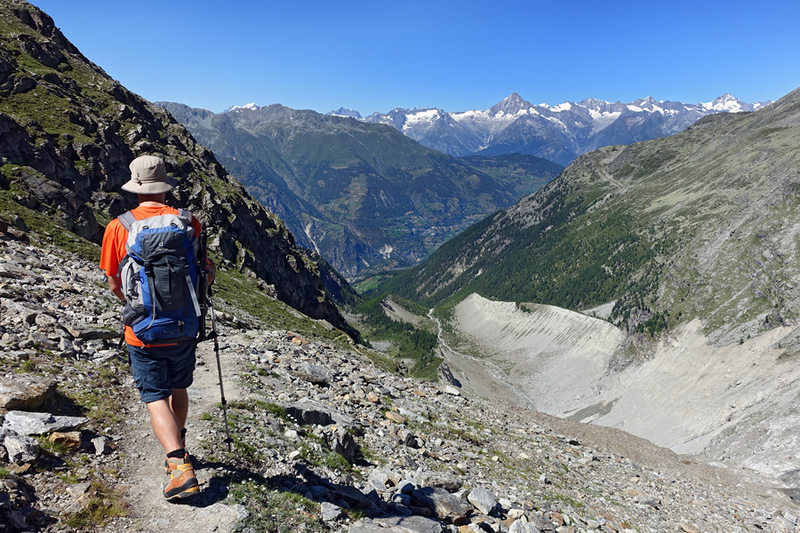 The headlamps from the group heading up to do the Nadelgrat traverse are visible on the other side of the valley. Theyv'e been going for about 2 hours and are almost to the ridge. The sky is clear and the temperature is cool, but comfortable... great weather for a hochtour! 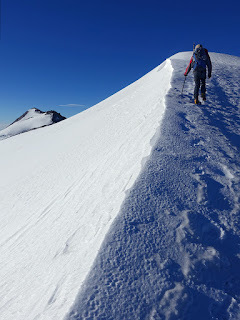 We make it to the saddle in good time and turn to follow the ridge towards the Gross Bigerhorn, new territory! There are plenty of stonemen and the route is pretty easy to follow as we head up, up, up to the peak. We aren't early enough to make sunrise on the peak, but we do get a great view of the Bernese alps with the sun about to come up and the sunrise on the Nadelhorn. Getting to the peak of the Gross Bigerhorn is pretty straightforward, with a bit of easy scrambling, and the views really are amazing. We get to see greg's three favorite (in terms of shape) Swiss mountains at once: the Bietschhorn, Weisshorn, and the Finsteraarhorn are all nicely visible (though it's not the best angle of the Finsteraarhorn). Great stuff! From the peak of the Gross Bigerhorn we follow the ridge towards the Balfrin. Here the route-finding isn't quite as straightforward and things are "a bit" more exposed, but it doesn't take too long get to the edge of the firn. Here we break out the crampons and ice axes and continue. The firn is pretty icy (we heard someone mention this at the hut yesterday) and it's the first time we've done anything with crampons this year, so we pretty quickly opt to head over to the rock at the edge of the ridge and follow that - the deciding point for greg was slipping and getting the chance to practice his self-arrest technique (including a bit of dragging his face on the snow while rolling over; good thing he hadn't shaved, that extra friction was certainly helpful!). The rock leads us up to a broader, less steep firn shoulder that we follow the rest of the way to the North peak of the Balfrin. After a bit of picture taking we continue along the ridge, with a mixture of rock and snow, until we make it to the South peak. Here we run into the first other people of the day: two Germans who had planned to do the Ulrichshorn and Nadelhorn but had broken that off and are returning to the hut via this ridge. The rest of the ridge is just rock, so we take the crampons off and continue on our way. The descent along the ridge is a pretty straightforward: easy route finding and no real technical challenges, though the wind is pretty intense. We hit the snow saddle between the main ridge and p3644 and end up putting the crampons back on after a bit of time on the hard-frozen snow. We do the rest of that ridge with the crampons on (kind of painful because of the screeching on the rock, but good practice) and make it easily down to the Riedpass. This is our decision point. We're doing ok on time (it's 10:30, which was our planned time assuming breakfast at 3am and a 4am start) and we're both still feeling pretty fit. However, it's unpleasantly windy (and has been for a bit), greg isn't particularly enthusiastic about how steep the last bit of the climb to the Ulrichshorn looks, Andrea has some concerns about what the descent from the Windjoch is going to be like, and we're both still a bit nervous about the overall time factor. On top of that, we're both pretty hungry; this shouldn't be part of the decision process (we can always eat before continuing), but it almost certainly plays a role. We decide for plan B: take the glacier route back to the Bordierhütte. We break out the rope and the rest of the gear for the glacier and head a bit around the corner (to try to get out the wind) for a quick food break. We keep the break fairly short because we aren't 100% sure how to get through the mess of seracs and crevasses onthe glacier at around 3400m and we want to keep the two people who are descending in front of us in view (they've come up the glacier in the morning, so we assume they know a good way back down). We end up catching up to them just before the rock between 3400 and 3500m and make the decision that this is where we should leave the glacier and switch to the rock. 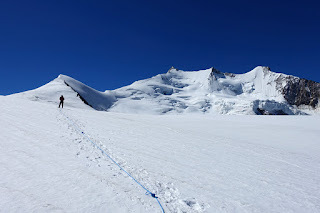 After taking off the crampons and putting away the rope, we continue for a bit, only to discover pretty quickly that we'd made the wrong call: the glacier is ugly, but the rock is worse. So: back on with the crampons and the rope (significantly shortened this time) and back out onto the glacier. The pair in front of us have already made their way through the mess and the pair behind us has caught up, but since they have done the Ulrichshorn traverse from the other side, they don't have a specific idea of how to get through either. Ah well. Andrea sets out, manages to find enough remainders of the trail from others (easy on the snow-covered bits, not so easy on the ice), and leads us all safely down through the mess. On one steep bit we do another bit of self-arrest practice as Andrea slips - we both react appropriately and she doesn't slide much at all, yay for the short rope and well-trained reflexes. We do another food break on a nice flat rock in the middle of the flat bit of the glacier below the step and then head onto the rock at around 3200m. We just had a food break, so we pack up all the gear and follow the stonemen back to the hut after filling up a couple water bottles with cold and delicious melt water. At the hut we eat a bit more and enjoy cool beverages while appreciating the last of the views, and then pack everything away before heading back down to Gasenried. On the hike down we get to enjoy the great views to the North that had been obscured by clouds on Saturday. At the bottom of the valley we opt to take the Europaweg down the last bit; this ends up being a nicely wooded (and soft! great for the tired feet!) path down. We get into town 10 minutes before the bus leaves; enough time to enjoy some last views backwards into the valley before starting the long (and after Visp crowded) trip home.